We're almost out of the winter free of blizzards, clear of long blocks of time with closed courses. Offseason golfers have had plenty of days to tee it up while the rest stay put until spring. Well, spring now appears on the horizon, and with March about to arrive, it's reopening season on Long Island. The big reopening story in 2019, of course, is Bethpage State Park, which is hosting the PGA Championship in May. That's great news for fans of professional golf's major tournaments, but a buzzkill for locals who'd rather have the Bethpage courses to themselves come spring. There will be more on the reopening plan at Bethpage as the spring draws closer. As for the rest, it's mostly reopen-for-business as usual. 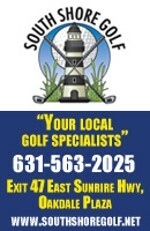 Long Island's seasonal golf courses get back up to speed from mid-March through early April. By the time The Masters whets everyone's golf appetite, most if not all area courses are typically open for play. The following is a list of tentative 2019 opening dates for Long Island's seasonal golf courses. (Year-round courses remain open as the weather allows and are not included in this list.) Courses will be added or updated as information becomes available. Be sure to check back through February and March for the latest info. *All dates listed below are subject to change. Call the courses directly for updated dates and times.